Faucet water filter, the accuracy of filtration is up to 0.1 um . Do not use electricity. Repeatedly washable combining diatom and ceramics NT hollow filter element, food grade ABS plastic material fuselage, harmless and durable. 4. Open the water for 3-5 sec every day before using the facet. If the faucet has not been used for over one week, please open the water for 10sec and clean water outlet. 5. Do not raise fish in purifier water. 6. When the filter water is smaller, the filter element needs to be cleaned, use sandpaper or dishcloth to clean the filter element, please gently wipe. 7. Replace the filter regularly, filter replacement cycle is recommended for 3-6 months, according to different water quality. Please read the instructions carefully before installing and use the product and keep it for future reference. 8 LAYERS OF FILTRATION: Our faucet water filter system uses an advanced filtration system tested and proven to improve the taste and quality of water. It has 8 layers of filtration, with a filtration accuracy that reaches 0.1um. You can filter a variety of harmful substances including reducing incidence of impurities, sediment, chlorine, rust, heavy metals, algae, colloid, bleaching powder, red worm, impurity and many more, left with mineral and trace elements. EASY TO INSTALL: Compatible with standard faucets, the installation of this water filtration system is a breeze. It easily attaches to your faucet without the need of any tool. Simply unscrew the aerator and washer from the threaded tip of the faucet and attach the filtration device to it. It is that simple! To make sure there are no issues, we have included 7 different types of connectors thus ensuring that we are covering the most common types of standard faucets. CONVENIENT AND EASY TO USE: Our Water Faucet Filter system is guaranteed to work hard to keep your tap water clean and fresh. The re-usable ceramic filter element can be cleaned thus saving you money from having to buy new filter element multiple times. It also allows you to easily switch between filtered and unfiltered water as needed, and unlike other similar product on the market, our own product allows for a large water flow when filtered, up to 2L / min / 100kpa. MADE TO LAST: Durability is ensured with its' high quality construction, premium non-toxic Food Grade ABS materials. It can withstand a hydraulic pressure up to 350KPa with its thickening body. Simply put, our Water Faucet Filtration system will give you years and years of clean, fresh tasting water straight from your faucet. 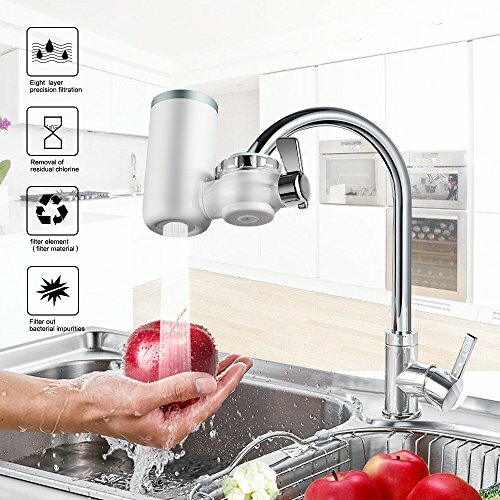 ECONOMICAL & ENVIRONMENTAL: Keep your tab water clean, fresh and safe for your family by using the faucet mounted water system, save on the bottled water or water filter pitcher for more economical and environmental option. Satisfaction Guaranteed, 30days exchange or refund, and 1-year product warrantee.